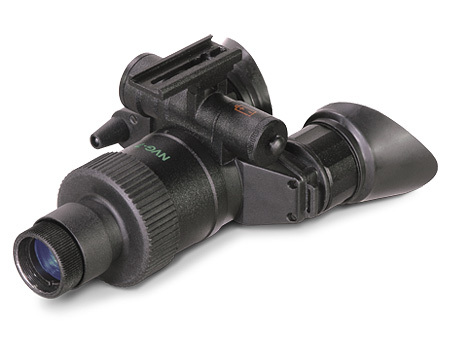 Main / Catalog / Night Vision Goggles / NVG7-2 Goggles 2nd Gen.
NVG7-2 Night Vision Goggles is a single-tube Night Vision System built around High Grade 18 mm Gen 2+ Image Intensifier Tube and utilizes a pseudo Binocular design for added observation convenience. It has a built-in IR light source for close-up illumination in complete darkness. Lightweight, rugged and a top-notch Goggles NVG7-2 is an exceptional choice for hands free usage. The NVG7-2 is available with a wide range of Image Intensifier Tubes to meet a wide array of specification requirements. The NVG-7 Night Vision goggles utilize the principle of intensification of the residual light which is reflected from the surrounding objects. The device consists of the objective lens assembly, eyepiece and the body. The body contains a image intensifier tube assembly with an integrated high voltage power source and the battery housing. Objective lens protective cover is intended to protect the objective lens from dust and scratches. It also will act as a daylight filter, allowing you to test the scope in daylight or other bright light situations. The pinhole in the center of the protective cover allows the user to check the operation ability of the device in daylight conditions. Built-in IR Illuminator makes it possible to observe the objects when the goggles work in the conditions of low light or total darkness. The eyepiece incorporates red LED indicator serves as an IR Illuminator Indicator and an Battery Low Indicator at a time. The device has a built in Automatic Brightness Control. Even under unsteady brightness conditions, this system always keeps the image intensifier tube brightness level constant. Automatic Brightness Control System do not protect a device from damage by bright light sources (a fire, headlights of the automobile, lanterns, etc.). Do not point the device at a bright light source. Built-in IR illuminator of NVG-7 is on when the red LE D indicator in field of view of goggles light becomes stable. If the red indicator in the FOV starts flickering, it means there might be about 20% of battery charge left. It is time to change your battery.